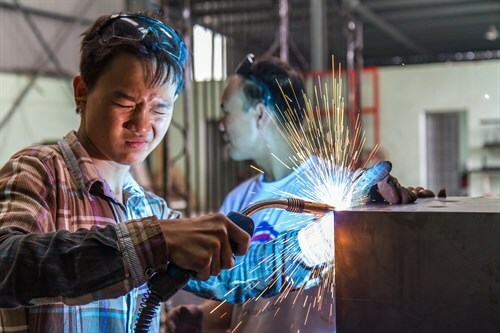 Hanoi (VNA) – A photo book featuring the evolving world of work in and around Hanoi was launched on May 25 by the Blue Dragon Children’s Foundation in Vietnam to raise money for charity. Entitled Hanoi Works, the book was co-produced by the photographer and medical doctor Ton Van der Velden and the graphic designer William Silva. The Hilton Hanoi Opera and an anonymous donor helped with the printing. All kinds of workers, including a tattooist, wedding photographer, flower street vendor, conical hat maker, garment workers, healthcare staff, and traffic policewoman - are featured in the book. The book costs 550,000 VND. Anyone interested in any photo featured in the book can purchase a print of the photo for 690,000 VND - or a mounted photo for 890,000 VND. All proceeds will be used to support education and vocational training for kids in crisis in Vietnam.